This Thing Called Life! : Foxy! 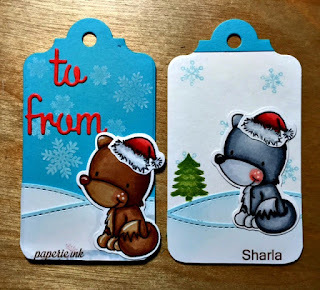 I'd like to share a couple of tags I made using the fox and santa hat from the Christmas Carolers stamp & die set you can find at Paperie Ink. The tag and to/from words are a tag die set from Sugar Pea Designs and the snow are dies from Lawn Fawn called Stitched Hillside Borders. The Christmas tree and snowflakes are stamps from Sugar Pea Designs Sweet Treats set. These tags are so sweet! Lovely colours. Thank you so much for joining us this week at the Simon Says Stamp Monday Challenge! Happy New Year!